This week USATC S160 2-8-0 5820 will handle all the services Monday – Friday. 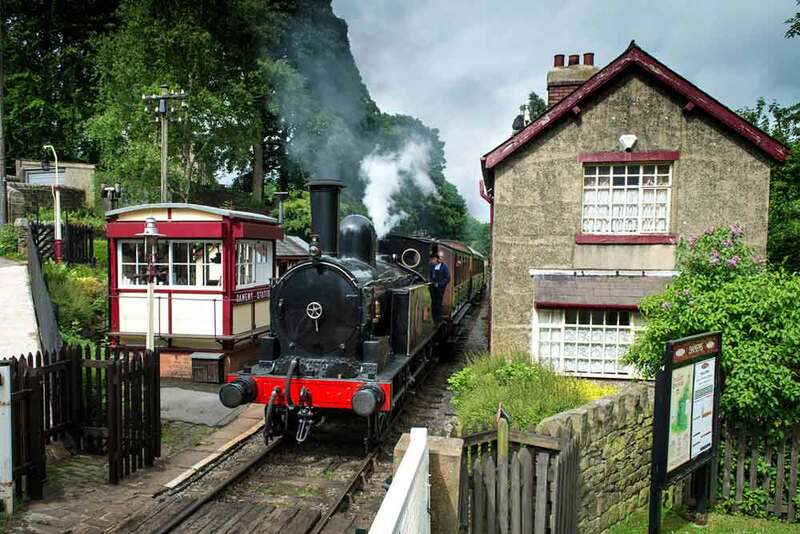 The first steam train leaves Oxenhope at 10.00 and the last service on the branch departs Keighley at 17.10 – 5 round trips in all. On Saturday 5820, continues for that day’s steam service. On Sunday 20th, 5820 gives way to WD 2-8-0 90733 which will be joined by TVR 0-6-2T 85 with another of our Sunday Vintage trains comprising a set of our more venerable coaches with four from the Lancashire and Yorkshire Railway Trust and the Metropolitan brake from the Vintage Carriages Trust. 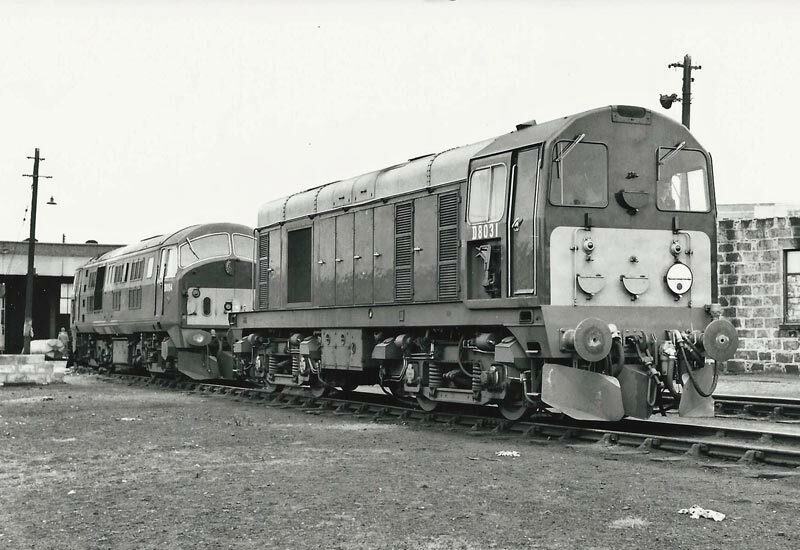 The diesel service on Saturday will be in the hands of our Class 101 diesel multiple unit. Monday – Sunday we also have the Vintage Bus Tours running between Oxenhope and Haworth and these are free to folders of a KWVR Rover ticket. For the timetables in operation this week for both the train services and Vintage Bus tour, please click HERE to visit the main website. Whilst every effort will made to ensure that the advised motive power is available, the Keighley & Worth Valley Railway reserve the right to change this when operational circumstances so dictate. Our popular Vintage Train Sundays – which operate on seven dates this year – start this Sunday, 5th June and will have a slightly different ‘look’ in 2016! 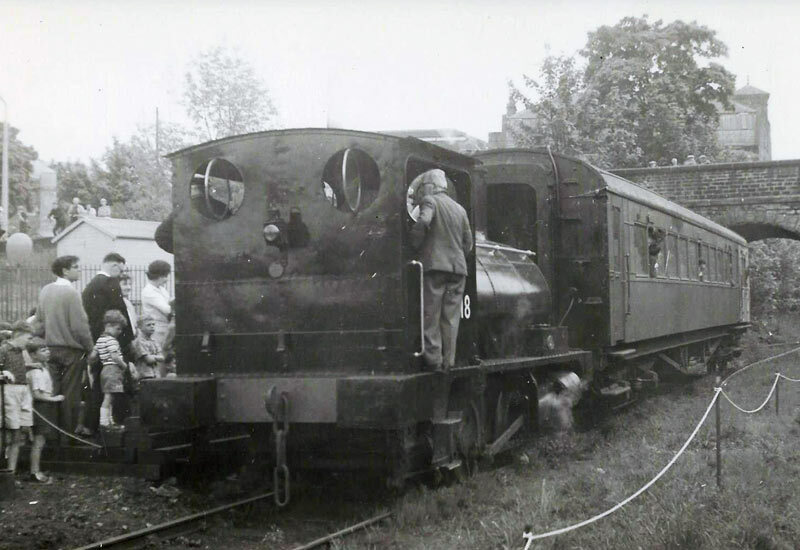 The shuttles will be worked by Bahamas Locomotive Society locomotives, either Hudswell Clarke 0-6-0T side tank no. 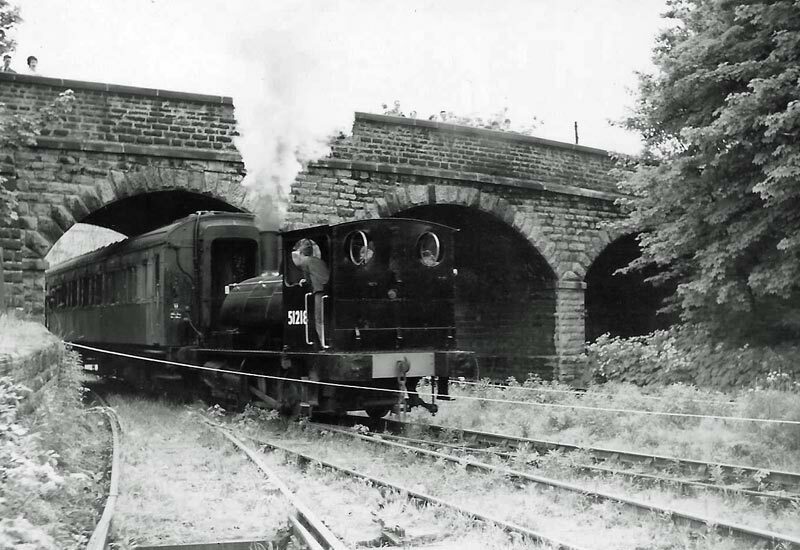 1704 ‘Nunlow’ or LNWR 0-6-2T ‘Coal Tank’ no. 1054. ‘Nunlow’ is the rostered locomotive for the first Sunday of this new venture. Whilst every effort will made to ensure that the advised motive power and rolling stock are available, the Keighley & Worth Valley Railway reserve the right to change this when operational circumstances so dictate. In a year of 50th anniversaries which have so far included the arrival of the first rolling stock and founding of the Vintage Carriages Trust, one 50th anniversary nearly passed un-noticed. 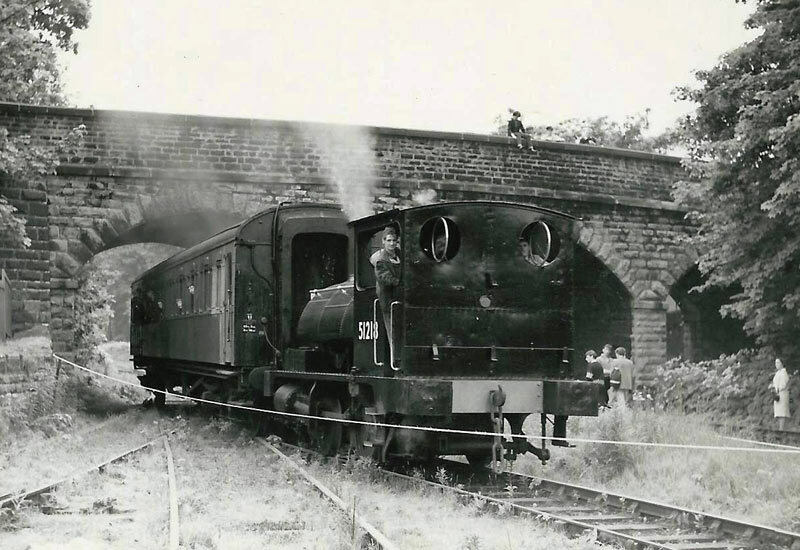 On the 5th June 1965, with stock having arrived only a few months earlier, the Keighley & Worth Valley Railway operated its first ever passenger train, although it was a far cry from the 6 coach Keighley – Oxenhope trains that regularly make the journey up and down the Valley today. It would be another 3 years before regular passenger trains returned to the Valley. Formed of Lancashire & Yorkshire 0-4-0ST 51218 and the Southern Railway ‘Matchboard’ coach no. 3554, the Railway offered rides out of Haworth Yard, under Bridge 26 and a short distance along Haworth loop in conditions that today would give any self respecting Safety Officer a heart attack. A few photographs survive of the day courtesy of Chris Bray and F. W. Smith and show not only enthusiastic men but wives and girl friends with children of all sizes queuing for a ride and swarming all over the tracks of Haworth Yard. A small but insignificant step for which we are eternally grateful 50 years on. 957 (52044), 1247 and 4744 stand silent awaiting their turn on another day. On the same day photographer Martin S. Welch was in the Highlands of Scotland and by chance took this photograph of BR Class 20 D8031 at Kittybrewster Shed, Aberdeen complete with tablet catcher and snowplough. It would be many years before this locomotive was withdrawn and avoided the cutters torch by being preserved on the KWVR; today operational with its later numbering of 20 031. 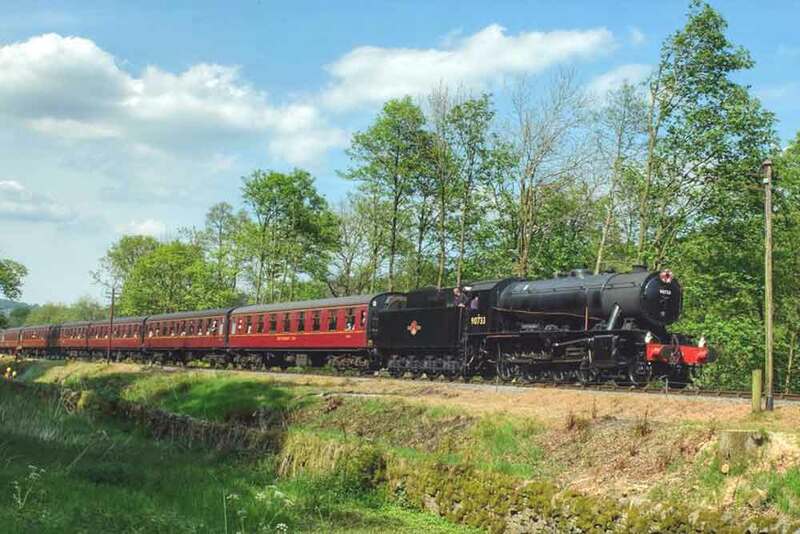 Whilst mainline operators like Virgin and First Great Western are replacing some of their First Class accommodation with Standard Class, the L&Y train owned by the Lancashire and Yorkshire Railway Trust will be gaining a First Class carriage in 2015. 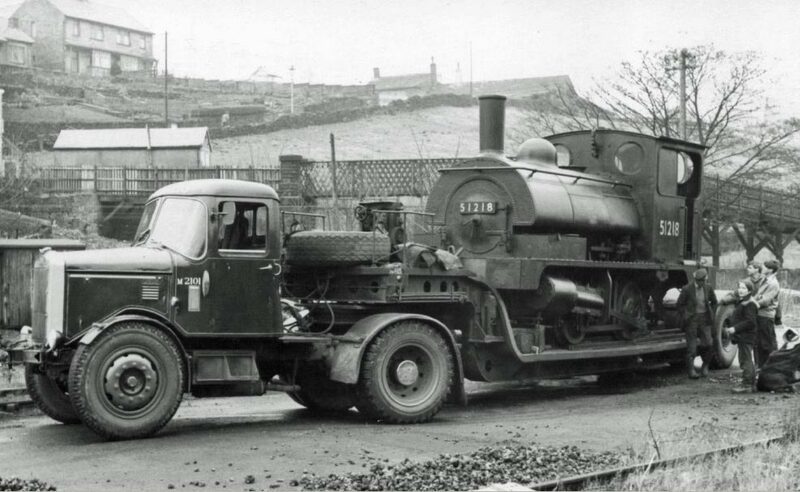 It is exactly 50 years ago today that the first locomotive arrived on the Railway, Lancashire & Yorkshire Railway 0-4-0ST ‘Pug’ 51218, purchased from Neath, South Wales by the L&Y Saddletanks Fund. The following extract has been re-created thanks to the kind permission of Lancashire and Yorkshire Railway Trust. 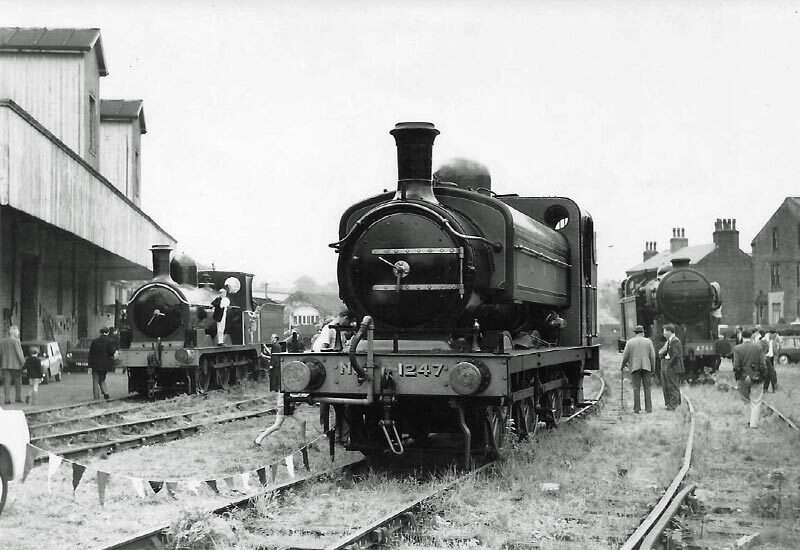 Following withdrawal by British Railways in September 1964 and purchased by the Saddletanks Fund in November 1964, the Worth Valley Railway were glad to greet the arrival of their first locomotive, Pug 51218, on January 7 1965. The railway is delighted to announce that this weekend ‘City of Wells’ will operate the Saturday Green steam service and the main Sunday Blue timetable service. Enthusiasts and the general public alike have shown a great interest in the return of this iconic locomotive and now the waiting is over. The Railway is looking forward to welcoming everybody to the Railway this weekend to come ride behind 34092 on this historic occasion. But don’t forget, that, in addition, Sunday sees the last of the Vintage Trains for this summer season, when National Trust locomotive, LNWR 0-6-2 ‘Coal Tank’ no. 1054, will again to be at the head of the Lancashire & Yorkshire Railway’s Trust‘s restored historical carriages. At the moment the roster for the weekend is provisional pending completion of ongoing remedial work. 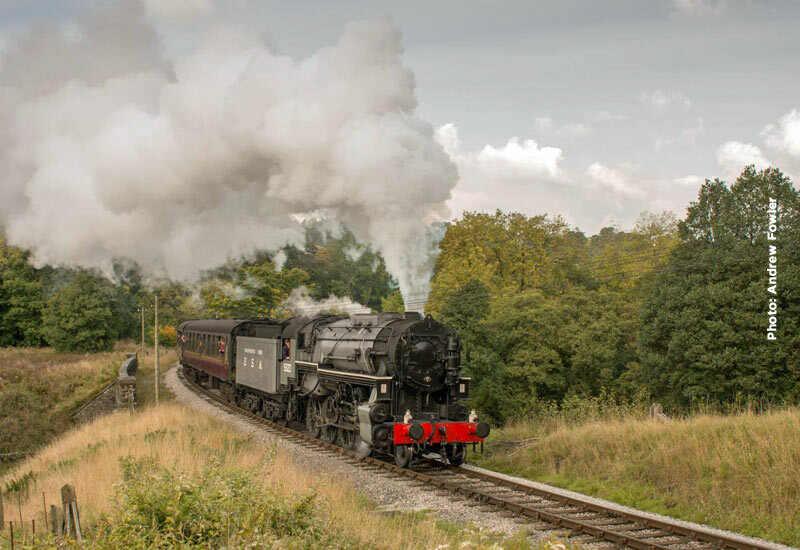 Currently it is anticipated that for the second weekend, LMS 5MT 4-6-0 45305 will operate the Saturday Green steam service and the main Sunday Blue timetable service. This Sunday sees the last of the Vintage Trains for this summer season, when National Trust locomotive, LNWR 0-6-2 ‘Coal Tank’ no. 1054, will again to be at the head of the Lancashire & Yorkshire Railway’s Trust‘s restored historical carriages. This week sees 4F 43924 give way to WD 2-8-0 90733 for the Saturday Green steam service and the main Sunday Blue timetable service. 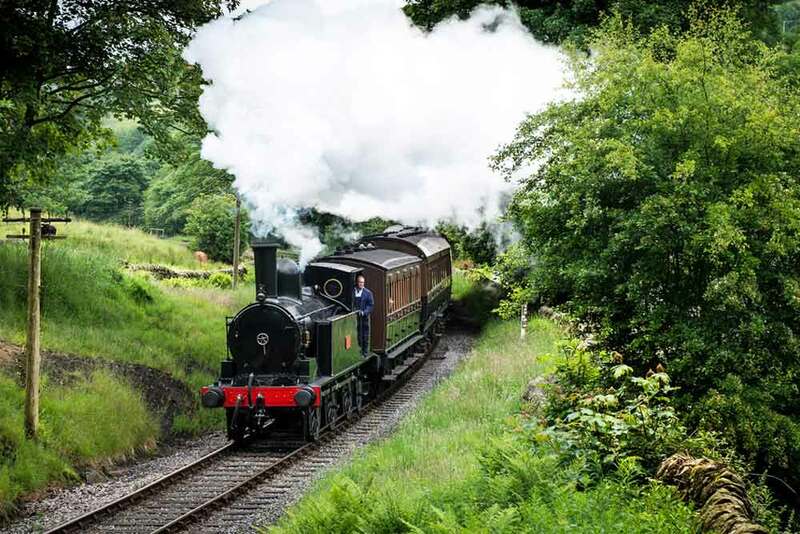 This Sunday is yet another chance to take a trip on the Vintage Trains, when National Trust locomotive, LNWR 0-6-2 ‘Coal Tank’ no. 1054, will again to be at the head of the Lancashire & Yorkshire Railway’s Trust‘s restored historical carriages. This week sees WD 2-8-0 90733 on the Tuesday – Friday Pink timetable. However the home fleet takes a rest on Saturday and Sunday when, advised LMS 5MT 4-6-0 45305 operates the Saturday Green steam service and the main Sunday Blue timetable service. 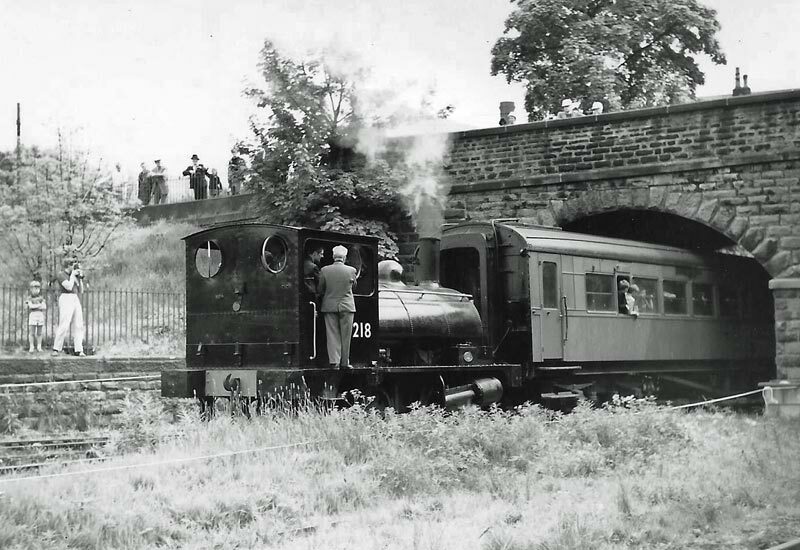 This Sunday is another Vintage Trains day, when National Trust locomotive, LNWR 0-6-2 ‘Coal Tank’ no. 1054, will leave its Bahamas Locomotive Society base at Ingrow West to be at the head of the Lancashire & Yorkshire Railway’s Trust‘s restored historical carriages. LNWR 0-6-2 ‘Coal tank’ 1054 was out on the mainline today hauling two of the Vintage Carriages Trust‘s Metropolitan coaches for the annual general meeting of the Bahamas Locomotive Society. This gave a taster for the first of the Sunday Vintage Trains when 1054 will haul the Lancashire & Yorkshire Railway Trust‘s 3 carriage vintage set tomorrow. Click here for details and here for the day’s timetable. The headline photograph shows 1054 with the Metropolitan First Class coach and Third Class brake leaving Ingrow yard today to take the AGM special to Oxenhope. 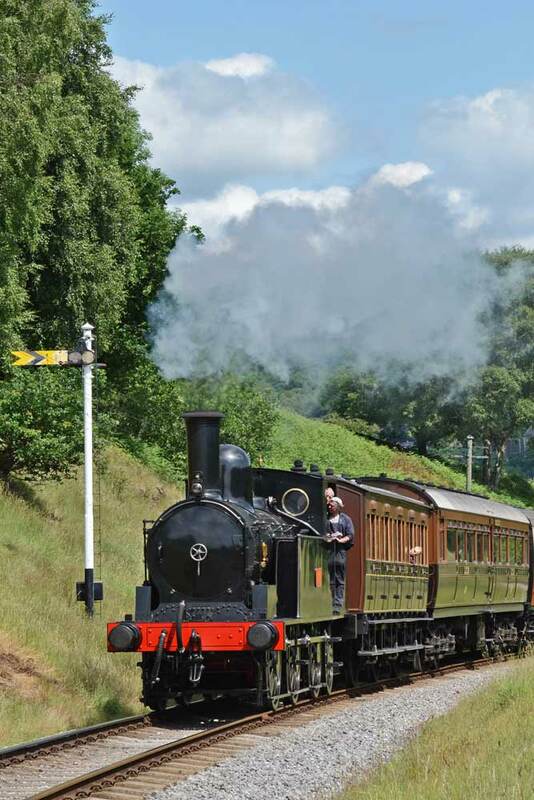 Our special Vintage trains will operate on selected Sundays throughout the summer using steam locomotives and coaches, one dating back to the days of Queen Victoria. Enjoy a rare chance to ride in historic wooden bodied carriages of yesteryear. The 2014 Vintage Train Sundays are split over June, July and August, June 22 and 29, July 20 and 27, August 10 and 17. This year trains will be hauled by the famous LNWR 0-6-2T ‘Coal Tank’ no. 1054 (Subject to availability). 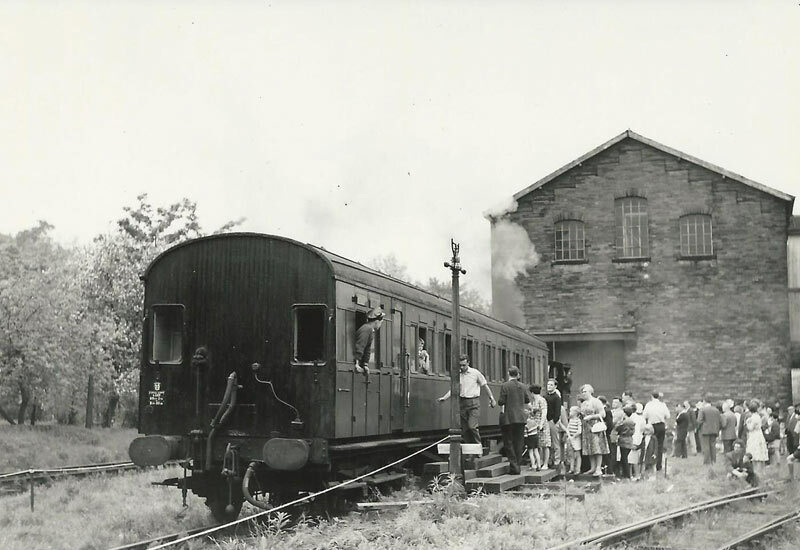 As announced elsewhere, the Old Gentleman’s Saloon is not available this year, so the trains will consist of all three operational carriages owned by the Lancashire & Yorkshire Railway Trust with an additional vehicle from the Railways operational fleet. As many readers are aware the Railway played host to a major film company last week with Keighley station transformed to represent a major mainline station elsewhere in the country and the rolling stock adapted to represent the period of the film. Enter your email address to follow KWVR News and receive notifications of all the latest news by email.